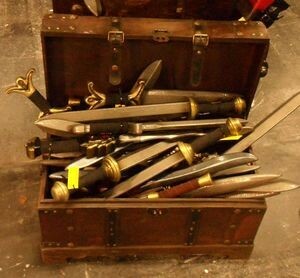 FeenCon is on this weekend. Also this weekend: WetzCon. FeenCon is the annual roleplaying convention in Bad Godesberg, with a renaissance fair in the park, where I always had readings in recent years. It’s a great con. Wetzcon is the official con of the SFCD /, the German Science Fiction Club. I will not manage to visit either of the Cons this year. On the one hand I feel very, very sorry about this because I always enjoyed going to FeenCon every year. And the WetzCon would certainly be great, too. I like Science Fiction just as much as I like fantasy and actually perceive the entire speculative fiction genre rather as one unity with ever-increasing interstitial subgenres. But I know that at least some of the older gentlemen of the SFCD tend not to agree with me there. Why do I know that? Well, some of the lads are very … explicit about their predilections and pet hates. Anyway, I will show my face at neither of the Cons this year. The problem is, I just can not be everywhere. From a marketing point of view, it would make sense to go to both. But then I need my weekends for writing. And basically we had planned to be far away on vacation around this time. When that did not work out, it was just too late to rearrange things. But when I look at the temperatures, I am very glad that I do not have to go anywhere today. Nevertheless, I’m going to miss my “Con-family”. I hope the con visitors spare a thought for me and drink something cold to my health – even water would do. And I also hope they cover their heads with wide brimmed hats, so they do not get pierced by the sun god! If I were at FeenCon, I would read “Cinderella” from “True Fairy Tale 2: Eleven classic fairy tale in a new guise“. If I were to read at WetzCon, then it would be one of my science fiction stories of “Bisse – 17 Extraordinary Stories”. Still, I miss the cons: my friends and colleagues, my readers and listeners. All are far away. I feel a little torn. But the heat glues everything together again. Of course one should write reports right after an event and not months later. But with my two jobs and quite a few additional obligations this does not always work. I could, of course, quote John Wayne’s “Never apologize, it’s a sign of weakness.” But in fact, I never particularly liked John Wayne, and in any case I find the axiom wrong. Not being able to apologize for when you messed up to me always seems much more to be a sign of weakness. Admitting a fault calls for more strength than not admitting it. 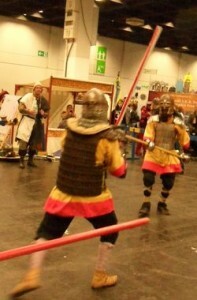 So, I should have written about the RPC in Cologne and the WGT in Leipzig long ago. Sorry to be late. On both events I was present and read from “Schwingen aus Stein” and from “Wahre Märchen 2: Elf klassische Märchen in neuem Gewand”. Both events were a lot of fun. So here’s a brief report of the RPC – Role Play Convention on. 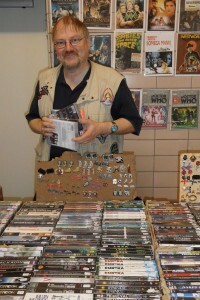 The event is a successful hybrid between trade fair (with dealers’ tables), hobby meeting, role play convention, costumers’ meeting and renaissance fair; and probably a lot more. I was almost a little sorry that I did not show up in costume. With all the wonderful costumes there, I did feel a little mundane and unimaginative between all those splendidly rigged out people. In fact, the event is also a little like a family reunion. You can hardly walk ten feet without running into old friends. And despite the absolutely hopless organisation by KölnMesse – no stand numbers anywhere – one did eventually find everything after a long search. I know the KölnMesse from my day job. When it comes to industrial fairs, it is generally far better organized. Thankfully, RPC visitors are imaginative and used to quests into the unknown. There is plenty to do on the RPC. For me, of course, the readings were the most important thing – especially since I had two of them. There was one reading after the other – two entire days of author readings Of course, one could also have listened to one band after the other the whole day, or could have indulged in actual sword practice. My husband drifted off to find the figure painters. He got stuck, and because of this you will find no picture of me reading. So you’ll have to believe me that it was a good reading, although conditions were difficult because of the noise level in the hall. Fortunately, the reading stage was equipped with headsets so we could contribute our share to the din. What I noticed particularly was the large increase of Steampunk costumers – something that makes me particularly happy because I feel very much at home in this scene. Wonderful costumes! I hope that I’ll get another chance next year to read at the RPC. Of course, the next year’s book will be no Steampunk but will rather belong in the classic fantasy field – although there will be no orcs or dwarfs or elves or dragons, because they are busy in other stories. I write. I sing. Write songs. 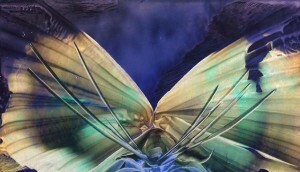 And sometimes – very rarely – I paint. But that is just for relaxation really. 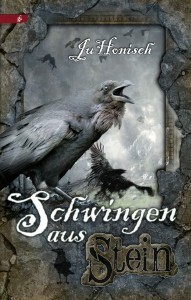 I two weeks’ time I shall read at Dreieich Con. And together with a good friend I shall have a stand at the con. Now, she is the real artist. Jela. I am merely a colour punk. So if you come to Dreieich con and still need some nice little Christmas presents, come to Jela. Oh, and I shall have my CDs on sale and books (signed) – and for the first time – paintings. Dreieich Con, 22. – 23 November, Samstag 17:00 – 18:00 Uhr, Stadtbücherei Dreieich, Bürgerhaus Dreieich-Sprendlingen, Fichtestr. 50, 63303 Dreieich. I went to two readings last month. The first one took place at Fark Convention , a wonderfully nerdy event in an old mine near Saarbrücken. I can only recommend it to everyone. There was role playing, a post-apocalyptic camp with impressive homemade end of time cars, much Steampunk, much costuming, a humungous dealers’ area and of course: readings. And it was all for a good cause, too. The event managed to make – and donate over € 20,000 to a children’s hospice. So not just fun, but help for those who need it. What could be better? I was scheduled for two readings. I read from my novel “Schwingen aus Stein” and also from my “Cinderella” interpretation published in the photopraphic + short story project “Wahre Märchen 2” (True Fairy Tales). I had a nice, interested audience both times. This is unfortunately not always the case. Only two weeks later a reading scored 2:0. Two authors – zero audience. That too can happen to writers sometimes, and one may be miffed about it, but if it turns out that there had been no advertising done for the event, then it can hardly be surprising. If no one knows that will be reading somewhere, no one will show up. Obviously. The next reading will certainly not lack an audience. It will take place at this year’s BuCon (Frankfurt Book Fair convention). On Book Fair Saturday at 12:00 a.m., you can come and hear me read. In any case, I strongly recommend this entire event. It’s been going and growing for many years, and it is the meeting point of pretty much all the German fantasy-authors, bloggers, critics, specialist publishers, etc. In the evening, the Deutsche Phantastik Preis (German Speculative Fiction Award – comparable to the Hugo) is awarded to the deserving winners, and you can enjoy an awards ceremony that could not be more unlike the Oscar night. And I mean that with a wink and a smile. This time I’m not nominated. 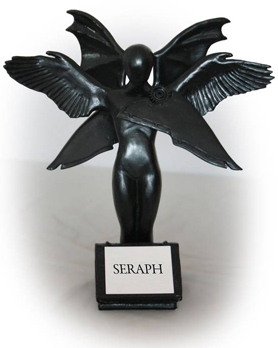 But I have already been awarded the SERAPH in March. Two awards for the same book would probably be immodest. And, dear me, we can’t allow that. I reviewed the event in “Zauberspiegel. The article is in German. Next week I shall be at Loncon. That’s the 2014 World Science Fiction Convention, held in London this time. And as the venue is so relatively easy to reach – the last ones were in Texas or Japan or Australia etc. – I very much wanted to be there. I’m looking forward to this immensely and have been quietly bouncing with anticipation for weeks. Since the World Con is programmed by the input of the writing scene and the active fandom I have several “gigs” or engagements where I will sit not only sit in the audience but will actively contribute to the show. One concert (with Katy, my duo partner), a “Kaffeeklatsch” (which is a friendly meeting between writers and readers who want to get to know a certain writer personally) and three so-called “panels”. The latter are a kind of talk show for a specific topic with three or four guests and a moderator or talk-master. Here you can see where I am going to be.